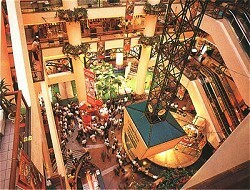 Sungei Wang Plaza, in the city of Kuala Lumpur features seven stories of shopping. With almost 500 stores this is the premiere spot to shop. Although the story is sad, because as with everything time fades the glory that this shopping mall once had in the heyday of the 1970s when it was built. Even though the walls and floors have faded with time, it still manages to draw the crowds. The saddest part is one day it will really be past the time it should have either been remodeled or torn down. It is the grand lady who will not step down and continues to draw her faithful followers. 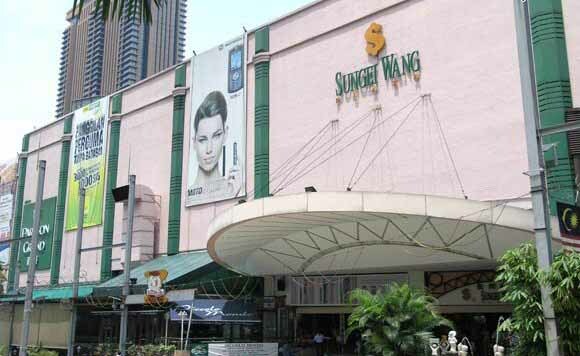 The walls are dull and losing their color, the interior has the shabby look of neglect, but the Sungei Wang Plaza comes alive when the crowds hit the shops looking for the bargains they have been coming here for years to find. The anchor of this grand shopping mall is The Parkson Grand, a department store which is surrounded by dozens of smaller shops all peddling their wares. The draw of the crowd is for the bargaining that can be done with nearly every business in the mall. The shops that sell electronics are high in number, many brands are big names. Yamaha and Bonita are just a couple of the big name brands that you will find. When the weekend comes, the floors would be flooded by patrons of this giant mall located in Kuala Lumpur. There are no fancy walls or floors. But when it comes to customers, the place hops. Some of their major selling items include childrens and adult apparel, toys, shoes, furniture, computer, and sporting goods. If you are looking for it, the Sungei Wang Plaza probably has it. The best part of all is that bargaining is allowed in almost every shop. Unlike its sister who is directly across from the shopping mall, joined by a walkway over the road, the Sungei Wang Plaza is filled most of the time with weekend getting even more so. Combined, the Bukit Bintang Plaza and Sungei Wang Plaza have over two million square feet of shopping for the crowds that come every day. The food is good high quality food of many types. The promotional events are held on a regular basis. With three split level garage space is plentiful so people have no problem finding somewhere to park. Walking distance from the area attractions, this is the mall to come to if you are a bargain hunter and like to shop. The mall is also connected to Lot 10 shopping center which makes it even more popular. The Golden Triangle District is home to so many shops that you could actually spend days here just shopping. The charm that is present in this old building makes up for the need for paint and remodeling. The ones who are looking for treasures are the customers and the independents, who carry the local popular brands are happy with their cozy homes that have been in the same spot for years. When you decide to come to Kuala Lumpur this is definitely above the norm and you will be glad of the chance to shop. What you did not bargain for is the size of the two shopping malls not to mention the other shops that are in the immediate vicinity. Whatever you are looking for, this would be the place where you can find all the bargains you can carry.